'Point Reyes' is one of the most common manzanitas in cultivaton. It has deep green shiny leaves. it makes a great groundcover and slope stabilizer. It uusally stays under 1 foot tallbut will spread to about 10 feet. It has proven to be very garden tolerant and has done well here in the interior heat with some regular summer water. 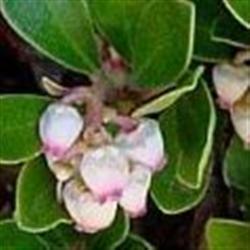 Give this manzanita a well-draining soil for best performance, but you will find it is not fussy about what type of soil; rocky or sandy, acid soils to richer heavier soils, Point Reyes seems to grow in all these conditions.